Seta-Waken, P., Malie, R., Utama, P. and G. Palaniappan Introduction to basic crop production, post-harvest and financial management practices: a training manual for smallholder vegetable farmers in western Pacific island nations. Edited by C.J. Birch and B.E. Chambers Canberra, Australia: Australian Centre for International Agricultural Research ( ACIAR), 2016. Ejiogu, Longinus Chukwuma and Palaniappan, Gomathy (2016) Poverty reduction through agricultural improvement and access to credit: a confirmation from the small-holder farmers in Anambra State, Nigeria. Journal of Sustainable Development in Africa, 18 3: 116-124. Palaniappan, G. and King, C. A. (2009) Localisation through Alternative farming: Embeddings for a better future. New Community Quarterly, 7 3: 22-24. Palaniappan, Gomathy, Nunez, Lilian B., Nicetic, Oleg and Abamo, Antonio P. (2017). Transforming gender relations through gender mainstreaming: a case study from the Philippines. In: 3rd Annual Rural Developrnent Conference, Bangkok, Thailand, (). 9-11 July 2017. Palaniappan, G. and King, C. (2006). An overview on comparative studies and changes in the farming systems and their influence on environment. In: Proceedings of the International Landcare Conference. International Landcare Conference, Melbourne, Australia, (). 8 -11 October 2006. 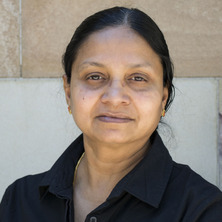 Gomathy Palaniappan (2009). Learning to Practice Transitional Agriculture: An Action Research Thesis PhD Thesis, School of Integrative Systems, The University of Queensland. Note for students: Dr Gomathy Palaniappan is not currently available to take on new students.